Shri Krishn Janmashtami was just sublime! That morning I woke up early and followed the usual rituals of bathing, changing my thread (janehu) and wearing a new dhoti and duppatta, before serving Radharamanji on the altar. When I reached the temple, I saw all of the Goswamis were performing their seva. An elder instructed me to guide the young Goswamis, take them to the Yamuna and collect water in silver pots. The thought of doing so much work which I was not accustomed to made me very anxious. I had heard that it can be really painful to carry 20 litre silver pots of water on the shoulder. Just before Janmashtami, I was on heavy painkillers, and that morning, I had forgotten to take them. Yet how could I refuse this service? And if I take the service, what will happen to me? This question was worrying me. I entered into the Deity room, where Radharamanji was getting ready for His bathing ceremony (abhishek). I touched His lotus feet, paid obeisances with my entire body (shastang pranaam) and I said to Him, “You will decide what will happen, but from the core of my heart, I do not want leave this abhishek due to poor health.” I left the Temple with five or six Goswamis and headed towards the Yamuna River. Finally we returned to the temple and I suddenly realised that I has no pain. By Radharaman’s divine mercy, I was able to perform His abhishek for the entire celebration, which lasts almost three hours. All of the Goswamis including my father were surprised. The last five days leading to Janmashtami, I had not been able to eat much prasad and I was sleeping only three hours every night. I was getting through each day by taking strong medicines. But I know that my Shri Radharaman Lal gave me just enough energy to perform the abhishek. Soon after Janmashtami, I had fever again. 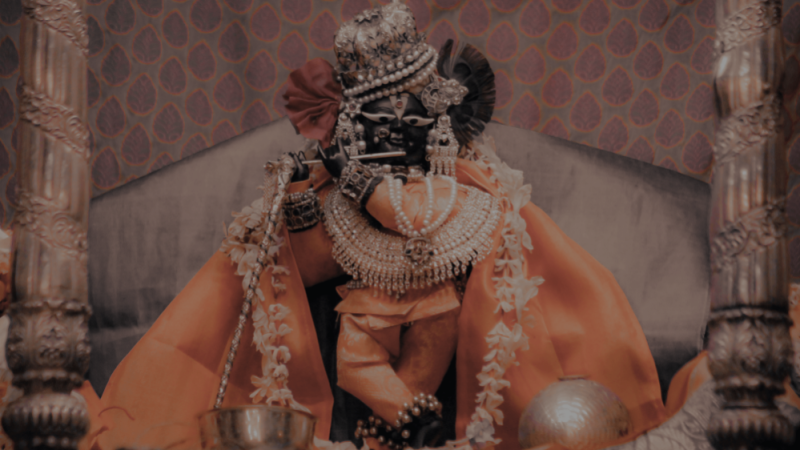 As I poured milk on Radharaman, my eyes were naturally fixated on His lotus face and I noticed His smile was very mystical, which prompted me to wonder what was about to happen next. I took a little break in between the abhishek yet my mind was still trying to guess what my Lord was thinking. I abruptly stopped myself. If we would come to know what Radharamanji is thinking, there would be no difference between Him and His devotee! My dear Lord, we have everything because of You. Our lives begin with You and end with You. Please bestow blessings upon us so that we can glorify Your Name all over the world.